Just a few years ago most PC users didn’t have that much choice when picking a boot drive for their system: you could get a relatively slow (with rotation speed of less than 7200 RPM), but relatively quiet hard drive, a slightly faster (7200 RPM), but noisier one or go with the fast option (10000 RPM), having to bear atrocious prices and noise levels. This whole situation has drastically changed after solid-state drives (SSD) became available in the market, since they combined their totally silent operation with high speeds, that were unachievable even by the fastest hard drives, in one device. There were however downsides to using SSDs — prices and capacity of first generation solid state drives left much to be desired. But, as everybody knows, progress goes on, especially in the field of IT — the cost per gigabyte of SSDs is constantly falling, while at the same time newer solid-state drives with more capacity become available in the market. Today we are going to look at one of the newest solid state drives from ADATA, which is called Premier Pro SP600. These SSDs were officially announced only about a month ago and are based on the modern JMicron JMF661 controller. ADATA is positioning these new drives as one of most affordable solid-state drives that support the modern SATA III 6 Gb/s standard, while also having a decent delivery set — the “Desktop Pack” packaging configuration consists of a special conversion bracket, that enables you to install this SSD into a standard 3.5 inch drive bay and the True image HD software suite by Acronis, which allows you to easily transfer your installed OS from the hard drive to the SSD. There also exists a “Notebook Pack”, which enables laptop users to upgrade their hard drive based laptops to this SSD, while moving the old hard drive into a supplied case, so that they can continue to use it an external or portable drive. 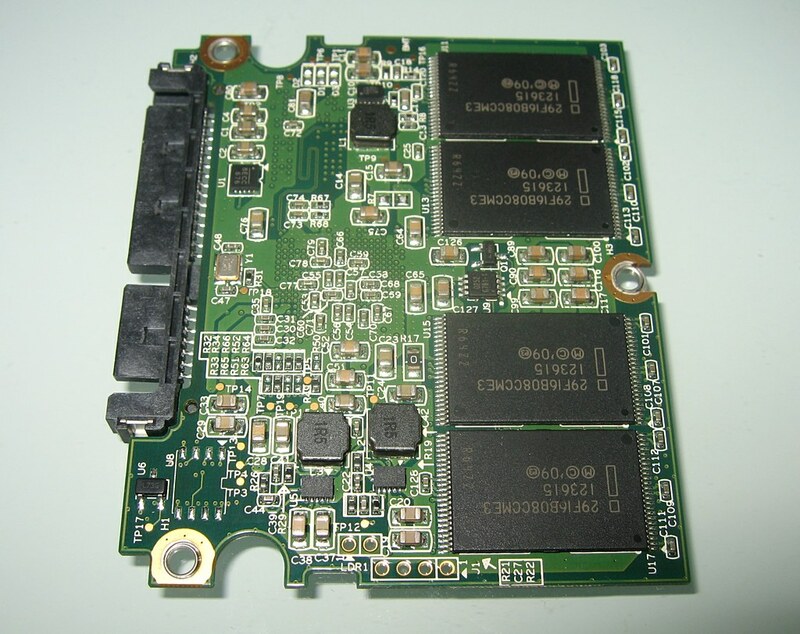 The manufacturer of this solid-state drive is worth a separate mention: the Taiwanese ADATA Technology is one of the largest international manufacturers of DRAM and Flash memory based products, who’s product portfolio is continuously expanding following modern trends. 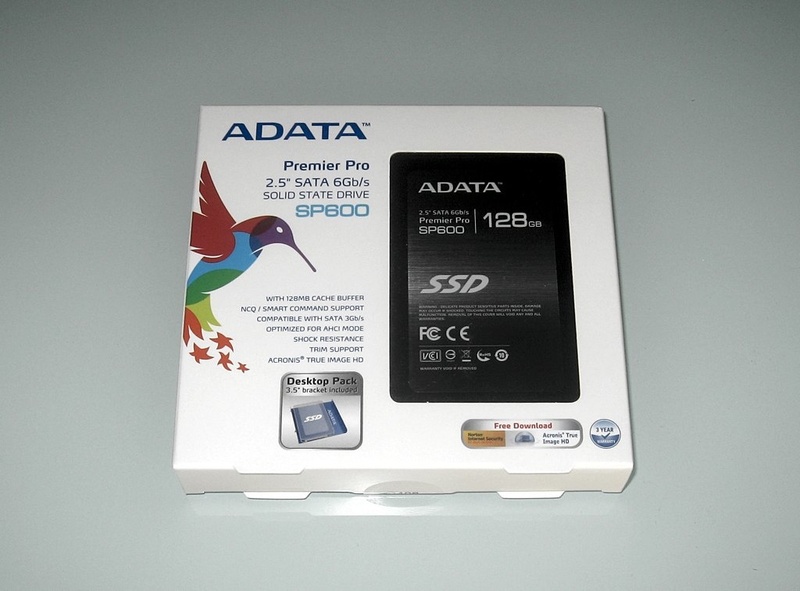 The new Premier Pro SP600 solid-state drive comes packaged in a small white cardboard box, which is decorated in ADATA’s corporate design. The front of its packaging specifies the model of this particular SSD, its main technical specifications and features, while also mentioning the delivery set. Aside form all that, the front side of this box also contains a cutout, that’s covered by a sheet of transparent plastic, which acts as a window through which you can see the ADATA Premier Pro SP600 solid-state drive. The box’s back side has some additional information about the product, with most of it covered by a brief description of this solid-state drive in twenty-one different languages. Aside from the solid-state drive itself, this “Desktop Pack” ADATA Premier Pro SP600 SSD comes bundled with a special conversion bracket, that enables you to install this SSD into a standard 3.5 inch drive bay, and some mounting screws. The box also contains a brief manual in eleven languages, that covers the process of installing the SSD, and a flyer on downloading and activating the bundled Acronis True image HD software suite, which allows you to easily transfer your installed OS from the hard drive to the SSD. When mentioning bundled software, we should also note that by registering your solid-state drive on ADATA’s website you can get a free 60 day trail version of the Norton Internet Security software suite. 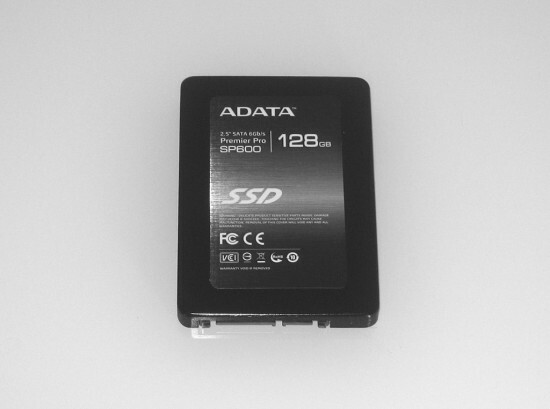 The Premier Pro SP600 solid-state drive from ADATA is made in a 2.5″ drive bay form factor, which is typical for these devices, with its dimensions measuring 100 x 69.85 x 9.5 mm, and weight of 76 g. Having been made in a 2.5″ form factor, this SSD is compatible with both desktop and laptop computers. 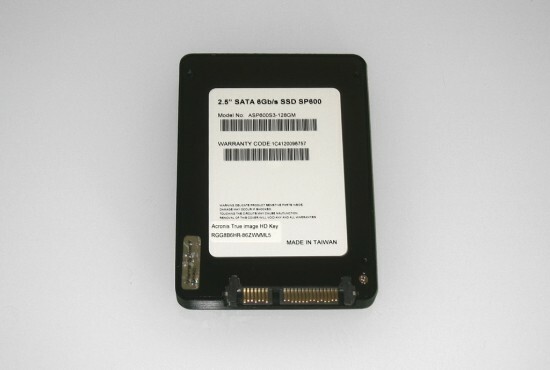 The bundled conversion bracket will allow the user to install this SSD even in an old PC enclosure, which doesn’t have a 2.5″ drive bay, by installing it in a regular 3.5″ drive bay. The enclosure of ADATA’s Premier Pro SP600 solid-state drive is made from black anodized metal, which features a light brushed metal texture. 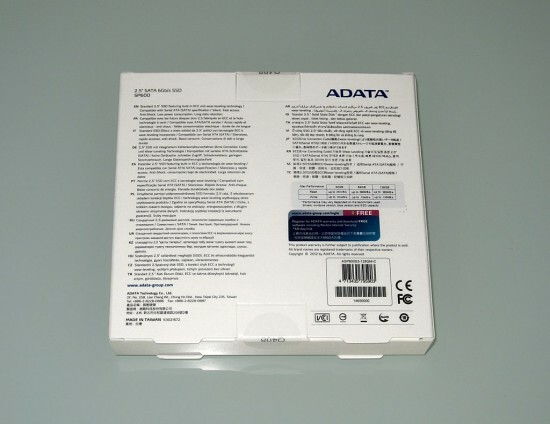 Both sides of the device’s enclosure are covered by large stickers, which cover up most of the surface area: s sticker on the front side specifies the manufacturer, model and main specs of the drive, while the back side sticker features two barcodes, a model number, warranty code (which is needed to register the device on ADATA’s website) and a product key to activate Acronis’s True image HD software suite. The drive’s back side is also the place, where you will find all of the screws, that hold together the housing of this SSD, with one of screws being under a warning label, which voids the warranty if broken. 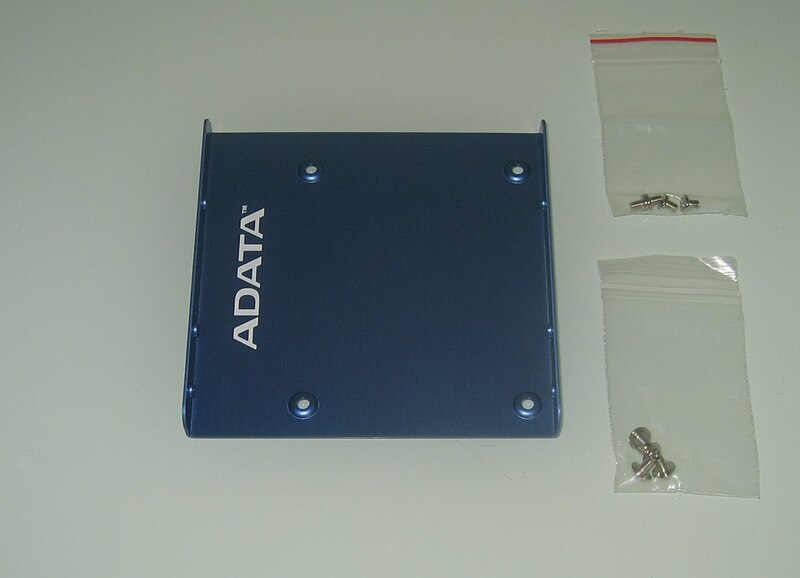 Upon opening the drive’s enclosure, we found out that the PCB of our ADATA Premier Pro SP600 model (128 GB) takes up only half of the housing, which could be interesting for modding enthusiast, since they can make a smaller custom enclosure for this solid-state drive. 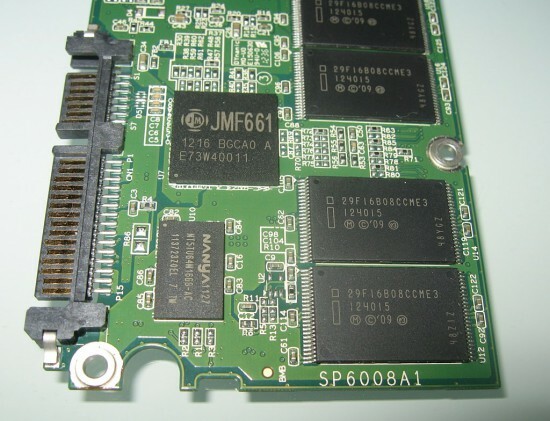 One side of this drive’s PCB contains a JMicron JMF661 controller, a chip of 128 MB DDR2 NANYA NT5TU64M16GG-AC cache memory and four chips of MLC NAND Flash memory, while the other side of the PCB has another four of these chips. Since we mentioned the chips, the ADATA Premier Pro SP600 solid-state drive features high-class synchronous flash memory chips from Intel, which are labeled as 29F16B08CCME3. Based on this labeling, the chips are made on 25 nm fabrication process and have the capacity of 16 GB (2 cores of 8 GB) per chip, they will withstand 3000 program-erase (P/E) cycles. It should be noted however that most of the time P/E cycle specifications for solid-state drives are given very conservatively, referring to very tough use cases, while regular home use (even by an enthusiast) is much more forgiving to a SSD. Considering this, you shouldn’t really worry about P/E cycles or try every possible way to reduce the amount of data that is written to the SSD (like disabling or moving the swap file and other temporary data). It so happens that in most cases SSDs are tested with synthetic benchmarks and, most often, against other SSDs. In our opinion, such tests are not that useful for most users. On the one hand, due to the synthetic nature of used benchmarks, you will not know what kind of performance to expect in a real world application. On the other hand, due to SSDs being tested against each-other, a user who is still using an HDD (i.e. the vast majority of users), will not be able to tell the difference in the performance of HDD and SSD, which is actually quite big by the way. In our testing, we decided to use only real applications and real use-cases, that may be present in a home user environment. 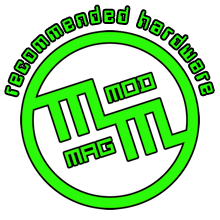 We also decided to test an SSD not against another SSD, but against an HDD that can be often found in home PCs, in this case a Seagate Barracuda Green 2 TB (ST2000DL003-9VT166). This hard drive generates a very low noise level (for a hard drive of course ;-)), and has quite good performance for its class. Similar models of hard drives can often be found in home systems, as for most of them the noise level is as critical, as is performance. In our testing, we used the same disk image of a working operating system install (Windows 7 Ultimate x64) on both the SSD and HDD, all test were repeated several times, with reboots, to obtain stable and reliable data, the results are averages. For time measurement, we used special software or recorded screen with timing info using a camera. Even if you have the need for frequent reboots, testing Windows start up time is an important indicator of the overall performance of the drive. Information about Windows start up time was collected using a utility called XBootMgr, which is a part of Windows Performance Toolkit, which in turn is a part of Windows 7 SDK. In our case, the system was optimized using the same utility before the test. 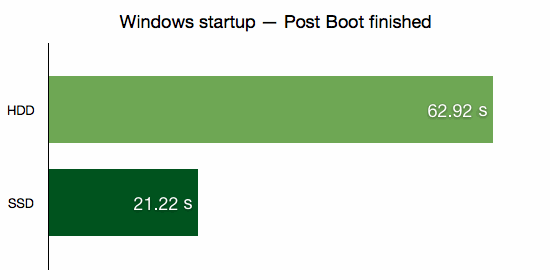 In this test we are interested in the time it takes to start the explorer and to complete the boot phase called postboot. The desktop appears when explorer is started, but the operation system is completely loaded only after the end of postboot phase, which includes a variety of background service processes. As our tests showed, when using ADATA’s Premier Pro SP600 solid-state drive the operating system loads almost tree times faster, than when using Seagate’s Barracuda Green 2 TB (ST2000DL003-9VT166) hard drive. 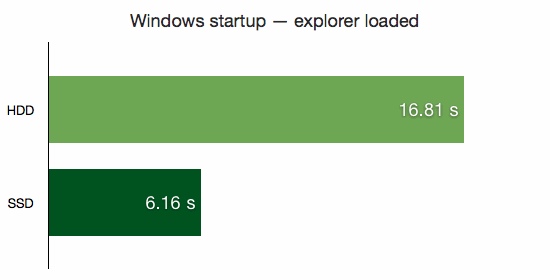 And not only does Windows load faster when using a SSD, it was much more responsive after that as well. 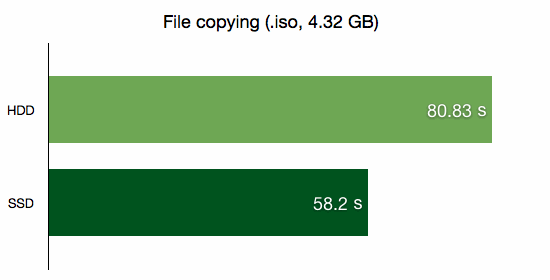 Copying a large file is a good test of drives speed, since it involves simultaneous read and write to the drive. In our case, we copied an .iso image of a DVD (with file size of 4.32 GB) from one folder to another, both located on the same drive. As you can see, when using ADATA’s Premier Pro SP600 solid-state drive we accomplished this task in average of almost 40% faster, than when using a HDD. 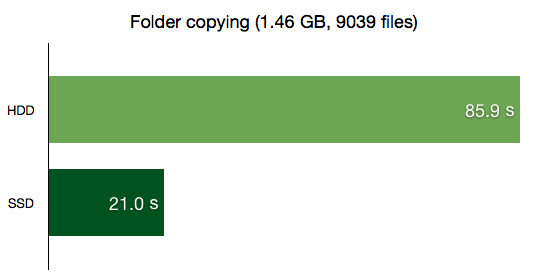 Copying a folder with lots of small files in sub-folders is the exact opposite of a previous test. This test should load the disk subsystem much higher. In this test, we used a folder with an installed game called Victoria 2, which is 1.46 GB in size and houses nine thousand and thirty nine (IT’S OVER 9000 !!! !1111) files in eighty-seven sub-folders. 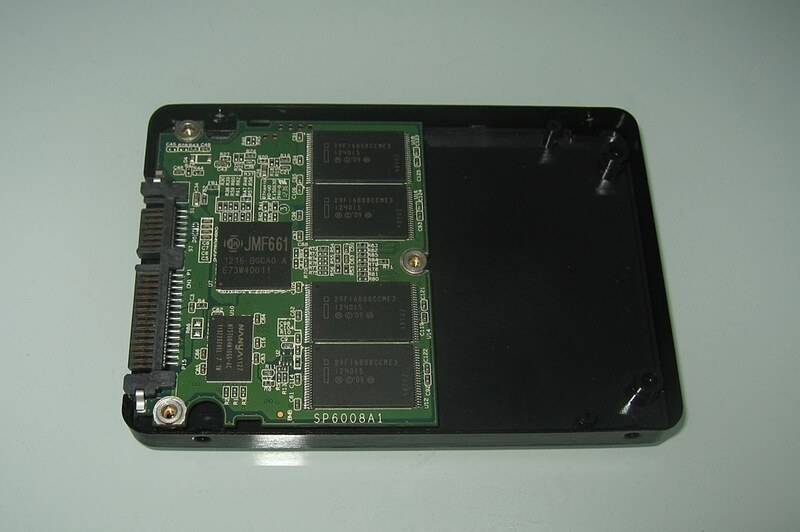 As we expected, increasing the load on the disk subsystem has significantly increased the gap between HDD and SSD. As you clearly see above, when using the Premier Pro SP600 solid-state drive we accomplished the said task more than four times faster, compering to when using a HDD. Working with a large amount of relatively small files is one of the strongest points of SSDs, this is due to exceptionally low file access time, almost non-existent, when comparing to a HDD. As one of the real world tests, we decided to install a free Apache OpenOffice 3.4.1 office suite (installer size is 135.9 MB). For convenience, only time of the actual installation was measured, excluding uncompressing, preparations of various kinds, etc. We added this test because speed of software installation is often limited by the performance of disk subsystem. As can be seen in the chart above, when using ADATA’s Premier Pro SP600 solid-state drive we accomplished the installation in average of almost three times faster, when comparing to using a HDD. The processes that went before the actual installation (that we excluded for convenience) also went a lot faster when using an SSD. 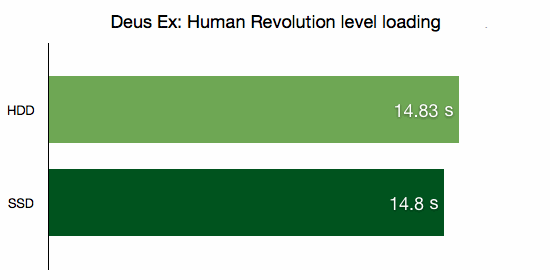 Since a significant part of computer enthusiasts are also PC gamers (some would argue that most of them are), and modern warfare games can be quite a heavy load on hardware, we choose to measure loading times of “Deus Ex: Human Revolution” as one of the real world test. Only actual load time was measured, all intros and commercial videos where skipped. Considering that loading “Deus Ex: Human Revolution” isn’t a very disk intensive operation, when using the Premier Pro SP600 solid-state drive, we still where able to load it more than one-third faster than using a HDD. 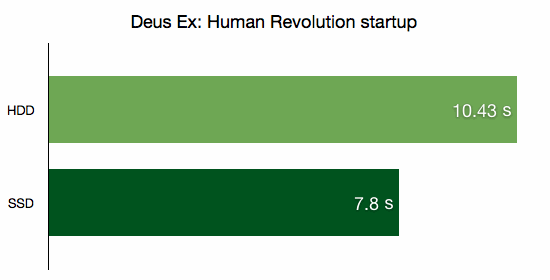 In the next test we measured the time it took to load a level in “Deus Ex: Human Revolution” from a save file. We measured the time from pressing the load button to the appearance of a loaded level on the screen. One look at the chart above and it’s obvious that loading a level in “Deus Ex: Human Revolution” wasn’t in anyway limited by the computer’s disk subsystem. Because of this, using an SSD didn’t produce any significant advantage with the result being only marginally better than using a hard drive — the solid-state drive was just three hundredths of a second faster. 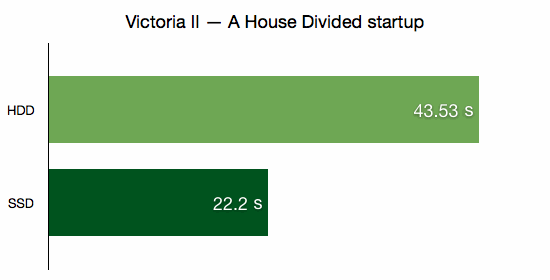 Continuing with the game tests, we decided to measure the loading time of a modern grand strategy wargame, and we chose “Victoria II: A House Divided” by Paradox Development Studio as a prime example of one. Given the nature of grand strategy wargames, and the need to process a lot of small files, this game should show a much higher contrast between a HDD and an SSD. As in previous tests, only the actual time of loading was measured, with the intro skipped. As we expected, this game puts a significant load on the disk subsystem, so using a Premier Pro SP600 solid-state drive allowed the computer to accomplished the load process in average of almost two times faster, when compared to using a hard drive. 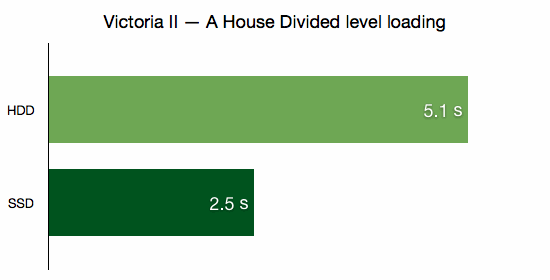 Since “Victoria II” showed such an interesting result in previous test, we have also decided to measure its level loading time. In this case, loading a level is a start of a new campaign in “Victoria II”. As in the previous tests, only the actual time of loading was measured, with intros skipped. Just as we expected, the situation from the previous test repeated inself: using ADATA’s Premier Pro SP600 solid-state drive made the load process in average of more than two times faster, than using a HDD. When you swap your PC’s hard disk drive to a solid-state drive, the first impressions are quite powerful, and ADATA’s Premier Pro SP600 is no exception. Even if you use a high-performance computer, upgrade to a SSD makes an impression that it became several times more powerful. Ordinary delays, that most users are used to, e.g. when opening a large file or an application, either disappear altogether or become much smaller. Of course, the computer doesn’t actually become more powerful in terms of raw computational power, but its performance is less likely to bottleneck at its slowest part — the hard drive. Again, the subjective impression of a speed gain when going to an SSD as a primary drive was much more impressive, than upgrading from dual-core Core 2 Duo to quad-core Core i5, while also doubling RAM from 4 GB to 8 GB — that should tell you something. In our opinion, solid-state drives are already a de-facto mandatory part of a high-performance PC. Otherwise, what’s the point in using high-performance CPUs, RAM and other components, only to let them bottleneck at the slowest system component, which is the hard drive. Bear in mind, that while prices of SSDs are on a steady decline and available capacity is growing, you shouldn’t really wait any longer to jump to an SSD — at the moment SSDs with 64 to 256 GB of capacity are already quite affordable, even for an average buyer. And SSDs with 512 GB to 1 TB are already out there for professional users and die-hard enthusiasts. As a rule of thumb, a 64 GB SSD is enough for OS and a small number of frequently used applications and games, a 128 GB is enough to accommodate the OS, all frequently used applications and a few games, and 256 GB is usually enough to forget about the limited storage capacity. Of course, all use case scenarios are different, so before buying a SSD you should determine what capacity you will need. After all the testing, ADATA’s Premier Pro SP600 solid-state drive left us with a pretty positive impression. Marketed as a relatively cheap (under $100 for 128 GB capacity), but modern (SATA 6 Gbps) solid-state drive, the Premier Pro SP600 showed that you don’t need to spend extra money on a top of the line SSD to get several times the performance (in many real world benchmarks/use-cases) of a standard hard disk drive. Besides performance, among the pros of Premier Pro SP600 we can also pick out its three year warranty (which is a de-facto industry standard), rich bundle and logical total silence of an SSD. Summing up all of the above, ADATA’s Premier Pro SP600 solid-state drive can be recommended to a wide range of users, who want to purchase a modern SSD, but save some cash, if possible. This solid-state drive will be an excellent choice for use as a primary system drive of any modern computer, whether it’s a laptop, gaming PC, silent PC, workstation or even some type of servers. We would like to thank ADATA for providing a product sample for this review.